Since I started law school, February has become my favorite month of the year. 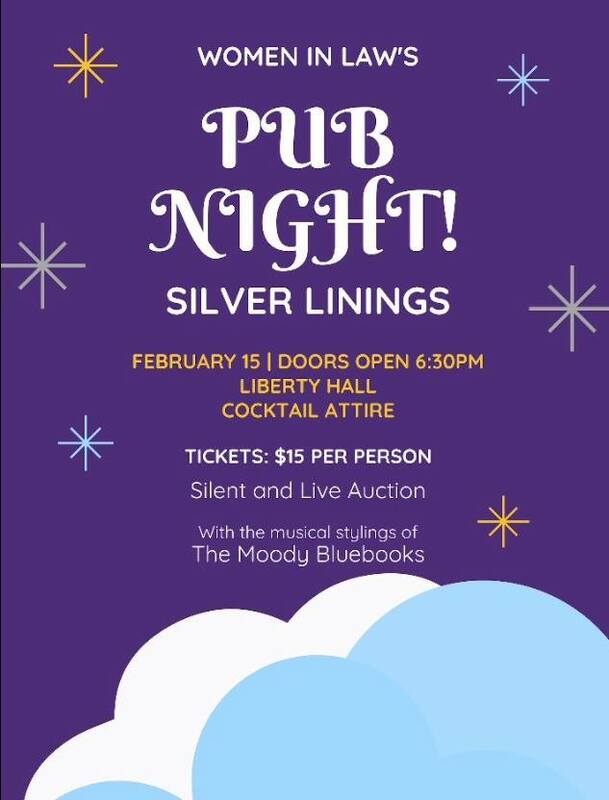 I don’t have any secret admirers professing their love or my birthday, but KU Law’s Women in Law hosts their annual fundraiser, “Pub Night” this time of year. It’s been a tradition since some of my professors were students at KU Law and embodies the things I love most about KU Law: tradition, community, fun and advocacy. Women in Law hosts Pub Night as a fundraiser for local organizations that promote awareness about domestic violence. The night includes student skits, fun cocktail dresses, silent and live auctions consisting of donations from downtown businesses and our professors. One year, a group of friends and I bid and won a tour of the Kansas Capitol and lunch in Topeka with our favorite public policy aficionado faculty. I helped run slideshows, put up auction items, decorate Liberty Hall and contribute to the 1L skit. In just the past two years, alongside classmates and friends, Women in Law has raised over $20,000 through event ticket sales, donations and auction items for the Willow Domestic Violence Center and Jana’s Campaign. Jana’s Campaign: the ten-year-old organization that promotes awareness and education programming about domestic violence. Its founders are parents of KU Law student, Jana Mackey, who was killed by her ex-boyfriend after her first year. Jana’s parents attend Pub Night each year to tell Jana’s story. 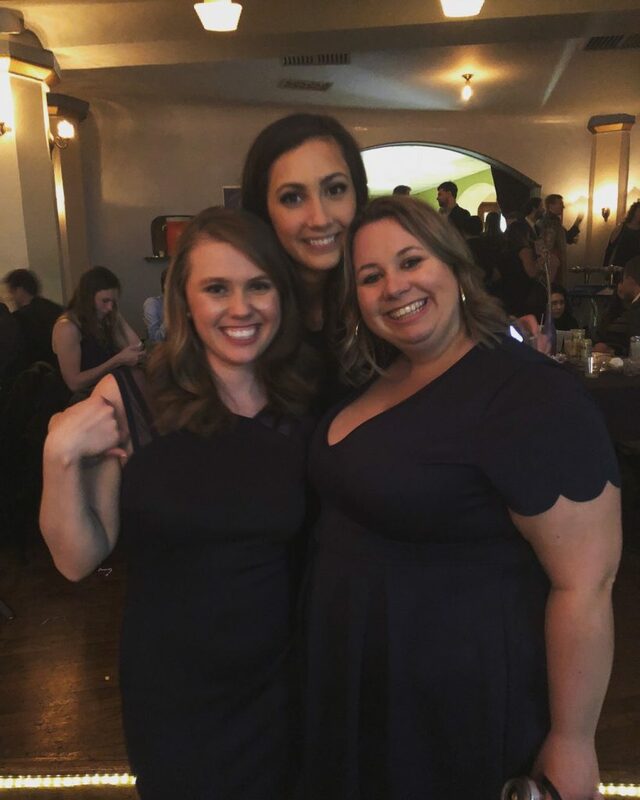 KU Law students Jessie Pringle, Erica Ash and Claire Kebodeaux attend the 2018 Pub Night event. In 2008 – while I was worried about starting high school – Jana Mackey was a victim of domestic violence. For someone I never met but have learned so much from, her legacy continues to inspire not only me, but generations of KU Law students to be passionate and zealous advocates as future lawyers. Pub Night is not only a fun social event that brings our community together on a Friday night. Rather, it brings our school’s students, staff and faculty together as a reminder that the KU Law community is special. It’s community that celebrates, supports and remembers its students. As I begin my legal career after graduation in May, I know I have been afforded an opportunity that was taken from Jana. And, I do not plan to waste it. — Jessie Pringle is a 3L and KU Law Student Ambassador from Chanute, Kansas. The 2019 Pub Night event has been rescheduled to April 5, due to inclement weather. Pub Night will be held from 6:30 to 10:30 p.m. at Liberty Hall in Lawrence. Get tickets.